Obviously the title is a bit incorrect in the "non-technical" claim, because we are dealing with a geekish subject here and I can't avoid being a little "techie". Still, my intent is to make it possible for a non-technical person to understand this and perhaps even identify and fix common networking problems. By the way, your network is obviously working if you are reading this. If it were not working, you wouldn't be able to read it, would you? You might want to print this out while you can.. just a thought.. the "Printer Friendly" link above is the best way to do that. I apologize to those who cringe at the very thought of it, but this is going to sometimes require working at the command line. For Windows, that's the DOS command program accessed by finding it in your menus or doing Start->Run and typing "cmd" (Vista and Win 7, hold the "Windows key" and hit "R" instead of Start->Run). For Mac OS X, you need Terminal. Hit Apple-space and type Terminal to find it. Linux users, stop laughing because I had to spell all that out. I'm going to cover two main issues here: problems in your local network and problems reaching the Internet or other networks. I'll do the latter first because even home users with one machine can have trouble reaching the Internet. The second part is about local network issues - printers, file sharing and so on. You'll find that in the Local Network Problems section below. I'll also cover VPN problems very briefly. If you are having trouble right now, you should first get to a command prompt (see above for how) and type "ping 8.8.8.8". If that works (if it doesn't hang or say "0 packets received"), skip directly to the section on DNS Problems and start reading there. If it does not work, keep reading here. The first thing to understand about getting to the Internet is that (assuming you aren't using dialup) a router is involved always. You may not realize that and support people may refer to your "modem", but somewhere, whatever you do is passing through a router. That router has an IP address. That address is your gateway to the Internet. You will see the terms "default route" and "gateway" used; in this context they mean the same thing. 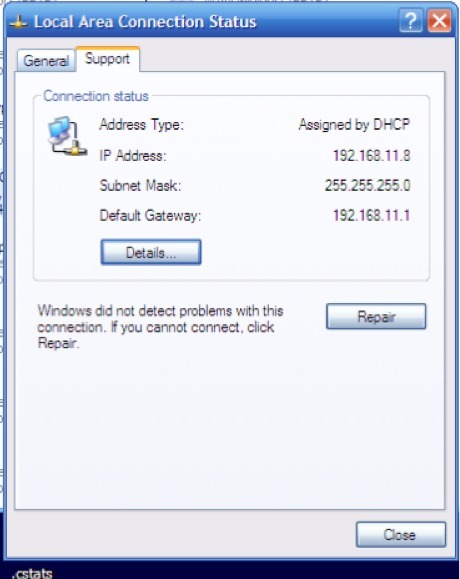 The next important thing to understand is that your computer itself needs an IP address also and it has to be on the same "subnet" as the gateway address. We simply have to get a little geeky here to explain it all, but there is one quick thing you can do that could tell you that you definitely have a subnetting problem. 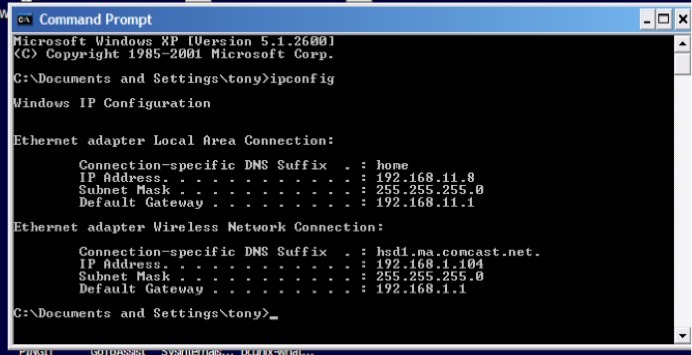 What is your computer's IP address? First, you need to find out what your computer is using as its IP address. Before you can do that, you need to know what interface you are using. Do not panic! All I mean is that you need to know if you are trying to make a wireless connection or are going through a plugged in cable. That much is easy, right? Now let's find it in your computer. To get the gateway, type 'netstat -rn"
The gateway (default route) is 192.168.11.1. You could also use "ifconfig -a" on Mac, but if you are command line phobic, the information Is available from the Network section of System Preferences. Note that in the Mac Preferences, the gateway is shown as "Router". If you are a recent Mac convert from Windows, you might gave gotten a surprise if you typed "ipconfig". OS X has a command of that name and it is useful, but it works a bit differently. In the DOS command window, you can use "ipconfig" and "ipconfig/all". On some Windows versions, you can run "ipconfig" from Start->Run. You can also find what you need in Control Panel, Networking. Find the interface you are using and right click on it. Choose Status and then click on the Support tab. Click Details to find all the information you need, including the gateway. By the way, if Windows tells you that the network cable is unplugged, that's the problem. If you can see that it really is not, you could have a defective cable, a defective network card or a defective router. We've seen IPV6 cause problems on IPV4 networks. If you don't need it, disable it. I've seen many Windows machines mistakenly configured to use a Proxy Server. Most Windows should NOT need that. See Proxy Server for where to shut that off. 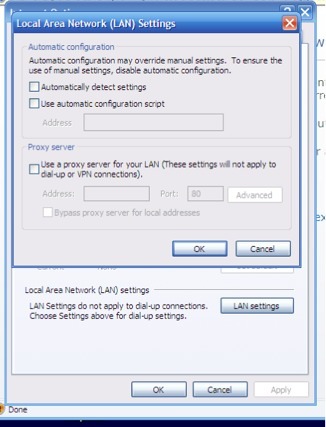 Also see LAN Connection settings keep changing back to proxy server after restart if that keeps happening. Ready for the techie stuff? What, you though that was the techie stuff? Ok, maybe it was, but we have to do a little more. 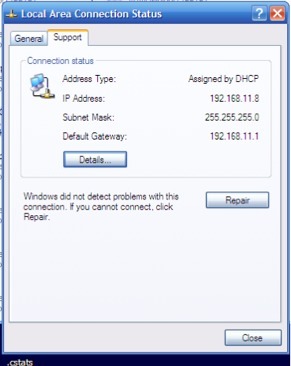 What you need to do is compare the computer IP address to the gateway address. First thing, they cannot be the same. Every address on a network (a "subnet", which may also be referred to as a "broadcast domain" in this context), has to be unique. No two devices can have the same IP address. The second thing is that they have to be in the same "subnet". This part can get very techie, but fortunately most simple networks will almost never have a problem with this part. I'll run through it just in case, but you probably don't have to worry about this. Your subnet is determined by the "subnet mask". In the examples above, that was shown as either 255.255.255.0 or ffffff00 (they mean the same thing). If you are part of a big network, you may see other numbers in the mask that are not 255. Figuring out which parts have to be the same gets more complicated. I do have other articles here that explain all that. This is important because, although the numbers cannot be the same, they have to be partially the same. How similar they have to be depends on that "subnet mask". In tis case, we know that the first three parts have to be the same because there are three 255's in the mask. So if our computer address is 192.168.11.2, the gateway MUST begin with 192.168.11 and the remaining number must not be 2. You don't need to understand subnetting and masks right now. Just realize that this part of the address has to be the same. So, if you see that your gateway is (for example) 192.168.2.1 and your computer has an address that begins with 169, you will definitely not be able to access the Internet. If you do see an address that begins with 169, that's usually a self assigned address. It usually means that the device has been configured to ask a DHCP server for an address, but did not get one. That could be that it can't "see" the DHCP server or that the server has no mote addresses to hand out. What to do? You can try "repairing" the connection. From the Windows command line, 'ipconfig /renew" can do that, or just click on the Repair button in that Status window. Mac has a similar option under the "Advanced" tab - it's "Renew DHCP Lease". Linux has different methods in different distributions, but "ifdown eth0; ifup eth0" is generic. You could also assign a manual, "static" address. That is a little more geeky, yes. I'm not going to cover that here in depth, but basically you need to pick an address that is not the same as any other local machine and that is in the proper subnet for the router and the rest of the network. See Networks 101. Windows will stop after 4 pings, Mac and Linux will keep going until you interrupt. That interruption might be Control-C. If that doesn't work, Control-\ should, but if that won't do it either, you may have to close the command or Terminal Window. You want to see responses from the gateway. Unfortunately, that gateway may not be configured to respond to pings. It's good to know that ahead of time, so ideally you would have tried pinging when everything was working normally and would know whether it should or should not respond. Most routers are configured to respond. If it does respond, that's good, because it means that stuff is at least partially working. If it does not and you know that it should, you don't need to check anything else. Something is broken - your computer or the router or the cables or switches. If you have other devices, you could go check Local Network Problems below to do some additional diagnostics. If not, there are things you might try, such as replacing the network card or updating its drivers. If there is a switch (you might think of it as a "hub", but it is most likely a switch") where the cable from your computer and the router are both plugged in, try moving your computers wires to a different port. The switch might be built into your modem; you can still try moving the cable. Pay attention to lights on the switch or modem - when you unplug, one light should turn off. In large companies, it might matter where you plug in. In a home network or a small office, any port on the switch is as good as any other. Failing that, you want to talk to the people who people who provide the router. No doubt they will want to lead you through everything we have already done. That's ok, right? If we can ping the gateway, we now need to try to go beyond that. We need an ip address that exists on the Internet. A fairly easy one to remember is 8.8.8.8, which happens to be one of Googles DNS servers and should always be available. Google's other DNS is 8.8.4.4. Some other numbers that should be reachable are 208.67.222.222, 208.67.220.220, 208.67.222.220, and 208.67.220.222. Those are DNS servers at Opendns.com. If you cannot ping any of these, your router may be bad. The problem could be farther out on the Internet, though. We can use another tool to check that. Before we get to tracing, consider what that ping of 8.8.8.8 told us if it worked. If you could do that, we immediately knew that your computer, your router and all local wiring is good. It saved a lot of checking. That's why I had you try that before you understood why you were doing it. But right here, that didn't work. We were able to ping the router on its "inside" address, but we can't get beyond. Is it the router? Traceroute will help us find out. Windows users: your command will be "tracert". Linux and Mac use "traceroute". You'll type "traceroute 8.8.8.8". There are websites that can do traceroutes for you. That's nice, but if the Internet isn't working, you can't get to those, can you? So what's the point? Well, sometimes PART of the Internet works, but other parts do not. That usually means that something is broken somewhere, but not right here. Somebody cut a cable in another state or a router lost power somewhere - traceroute can help find that. Here's an example trace to 8.8.8.8. I took out some of the intermediate results to save space. This completed after 16 hops, reaching 8.8.8.8. If it failed to reach even the first hop, that could mean either you or your isp has a problem. If it fails somewhere in the middle, someone else has a problem. Traceroute isn't an absolute indicator because it can fail when other things would work, but the diagnostic output can show you where a problem is NOT, and that alone is very helpful. If you know that the problem is out at hop 12, calling your local ISP probably is not going to get it fixed, but if it is hop 2, they likely are at fault. Check Wikipedia for more on trace route. Everything has worked up to this point. You were able to ping 8.8.8.8 which means your computer network is working. However, you still cannot browse the Internet. Why? It could be DNS. You test by pinging Internet names: ping yahoo.com, for example. Just as you did when pinging numbers, try a few. Ping ibm.com and google.com. If none of those works (and the numeric pings did work), you are having DNS problems. DNS is what translates names to numbers and numbers are what the Internet really uses. Your computer has been configured to use some DNS server and apparently that server is not doing its job. Do you remember that I said that 8.8.8.8 and the other numbers I gave you are DNS servers? You can plug one or more of those into your network configuration and possibly fix your issue instantly. For Linux, you'd edit /etc/resolve.conf and replace the "nameserver" line. 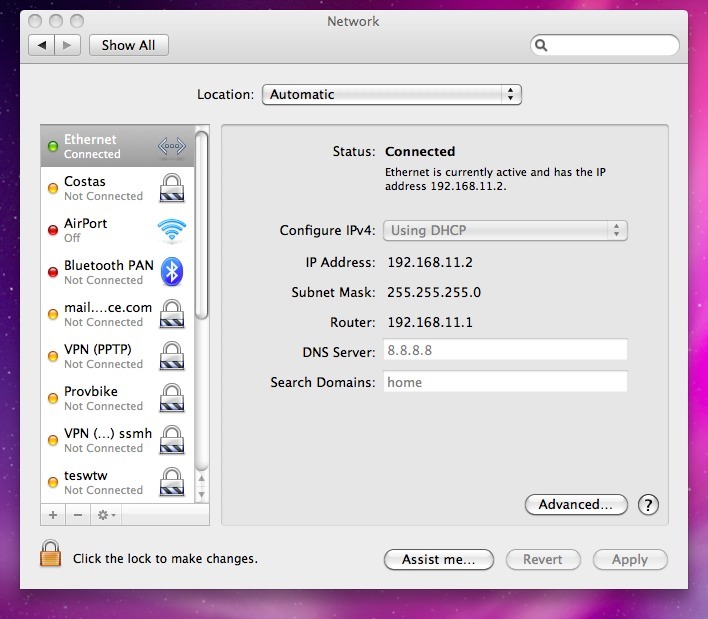 With Mac OS X, you'd click on the interface in System Preferences->Network and change the DNS Server boxes. For Windows, you'd right click on the interface, and choose "Properties". That brings up a scary box with a lot of stuff in it. One of them says something about TCP/IP. Double click on that and you'll see the places where you can specify DNS servers. We have DNS working but you still can't browse. Your problem very often is just that your browser is confused. This is unfortunately very common with Internet Explorer which is why I recommend having Chrome or Safari or some other browser available so that you can quickly see if it is just the browser. If Safari works and IE does not, you know the issue is fully within IE. That won't help if things don't work now, of course. If IE is not working, you can't go get Chrome or Safari. So what to do? Sometimes just quitting and restarting will fix it. Sometimes clearing the cache and deleting temporary Internet files will clear it up. Other times you need to get into more geeky stuff. Might I suggest you just use a better browser to start with? I have found that clearing "Automatically detect settings", quitting and restarting will "wake up" IE. Sometimes just the opposite is true - telling it to "Automatically detect" fixes it. Still broken?. Try Googling (using a browser that works - maybe you have to go to a neighbor,) for "fix Internet Explorer". You'll find enough to keep you busy, I promise. Most VPN issues are far too geekish to cover here. However, there is one simple "gotcha" issue I see frequently. You've been told that you can connect to the VPN server at your workplace. You have been given an account, a password and full instructions. Unfortunately, it doesn't work. It can be as simple as you and your work using the same subnet. That is, if your scheme at home is 192.168.2.x and the internal network at work uses the same scheme, that VPN cannot work. Changing all of your home might involve nothing more than reprogramming your local router, but it's all a bit too much to cover here. Another possible VPN issue is whether or not you are using the remote system for your internet access. That can be slower and can be routing you through a proxy server. However, it may also be the only way to get access to things you might need. 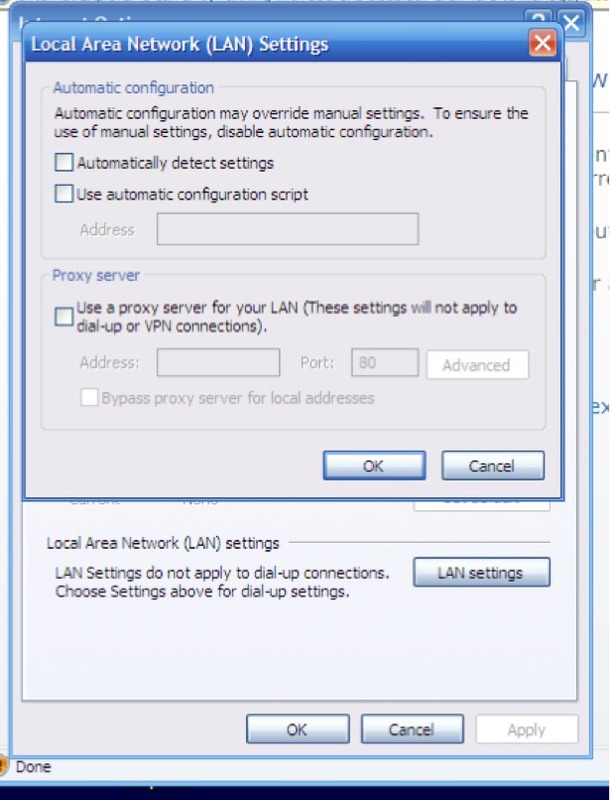 I'm not sure what causes this, but my neighbor's computer keeps getting the "Use a proxy server" box checked (Control Panel, Internet Options, Connections, Lan Settings). If you are supposed to use a proxy server, that would be correct, but most of us are not. Having that checked breaks her browsing, unchecking it returns it to working order instantly. Most home users will NOT have a proxy server, so that should usually be unchecked. If it IS checked, make a not of the address and try unchecking. Always quit and restart IE after these changes. If that works, your browser is at fault. Try another browser (Chrome, Firefox, Opera). Local network problems come from wiring, bad switches, duplicate IP addresses, missing IP addresses, firewall blocking and plain old confusion. You learned above that every device on your network needs a unique IP address but it is not and cannot be entirely unique: some part of it needs to match. You know how to check IP addresses on computers, but what about printers and other devices? If you have software that controls the device, check that first. Many printers can print out a configuration sheet that includes IP information. HP print servers often have a button that, if held down for a few seconds, will send configuration info to an attached printer. On Linux or Mac, I suggest using "arp -an" to get similar results. Notice the Physical Address column? That's the Hardware or MAC address I talked about earlier. On your local network, devices actually use that address to talk to each other. So, if you know the hardware address and can see that in arp, you can determine the IP. You can also use arp to set an IP for many simple devices, but again that's a bit more than we want to cover here. What we are looking for is a mismatch. Say that we know test the printer that is not working is 192.168.11.5, but its hardware address is NOT 00-14-51-ed-86-42. You may have found the hardware address from configuration information or it may even be on a label on the device itself. If there is a mismatch, you have a duplicate IP - whatever does own 00-14-51-ed-86-42 is using the IP you want for the printer. If it is easy enough to change the printer, do that. Otherwise you need to hunt down that 00-14-51-ed-86-42 machine or device. A device must have been recently accessed to show up in rap! Ethernet cable testers are not terribly expensive. If you are working for a an office, you'd want a good model that can test length as well as connection wiring and includes tone tracing ("fox and hound"). For a home user, it's easier to just swap the cable. If the new one works, throw away the old. The length testing is often just for a reality check. If you know the cable you are testing should be about 50 feet but the tester says 300, something is screwy. Either your wiring guy left a lot of looped cable in the ceiling or that cable has a problem. The fox and hound tracer can help you find mislabeled wiring - you think this wire is plugged in at the other end, but actually it is not because of a labeling error. Finally, the wiring must be pinned out correctly. The cable tester is simply invaluable for those reasons. A switch is not a router. A router may have a switch built into it but you don't want a router where you need a switch. Inexpensive switches don't have IP addresses - they are invisible on the network. Managed switches have their own IP address and can provide functions like enabling or disabling specific ports or segmenting a network. That's all beyond our scope here; what you need to know is SWITCHES GO BAD. Individual ports go bad and whole switches go bad. You can go crazy trying to figure out a network problem caused by a flaky switch. Move the wires to another switch to test, particularly if thus switch is a few years old. If you are reasonably quick about it, you can swap out one switch for a new one on the fly. Nothing will get interrupted if you just quickly swap the wires. Watch out for accidentally plugging a switch into itself - most switches will go insane if you make that mistake. With some advanced switches you can do that and would do it for redundancy, but that's far beyond this article. Firewalls Firewall configuration is way beyond our scope, but firewalls and even antivirus software can interfere with network function. It is worth just shutting anything like that off to see if it is involved in your difficulties. If so, at least you know where it us even if you can't fix it yourself. How to shut it off - there are too many possibilities. The built in firewalls in mac and Windows are easy enough to find, but third part software may not be so obvious. Look around the menus of any AntiVirus software - that sometimes includes a firewall component that can be shut off for testing. Step back. Now that you know how things work, pause and try to think about where your problem might come from. For example, if the MAC address of a device you are trying to find indicates that it is an Intel card, you don't need to look at HP printers. If you can pick up a device and move it to a new location and it works, you know it is a physical problem. Network troubleshooting can be difficult. Obviously I have only skimmed the surface here. I have more technically oriented articles if you want to go deeper. I also sell a Unix and Unix troubleshooting book that can help if you are in that environment. Reiteration to everyone who wanders over to this article: Print it and save it somewhere. When (not if) your connectivity goes kaput, you'll be glad to have the "non-volatile" paper copy handy as you attempt to troubleshoot your network. If you are having trouble right now, you should first get to a command prompt (see above for how) and type "ping 8.8.8.8". For those who skimmed the article, the IP address 8.8.8.8 is one of Google's DNS servers. You can also try 4.2.2.2 or 4.2.2.3, both of which are top-level (root) domain servers. If you can't reach them you ain't going nowhere! It don't mean a thing if it ain't got that ping.